Ample onsite parking with 2 handicapped spaces. We can accommodate groups over ten guests by reservation only. A prix fixe menu of at least three courses will be created for your group and a credit card is required to hold this reservation. For larger parties (11 guests or larger) our events building is a beautiful private space that can seat up to 50 guests. Please email info@apisaustin.com or call 512.436.8918 to book. Apis Restaurant and Apiary offers elegant cuisine in a rustic yet refined atmosphere. Apis aims to offer Hill Country residents and visitors a unique and exquisite dining experience, gracefully refined for special occasions, yet relaxed enough to become your regular culinary sanctuary. Apis, located at Highway 71 and the Pedernales River, is named for and inspired by the honeybee. With a few honeybee hives onsite, and more with our partners, Jack Ranch, and TerraPurezza, the apiary provides our house honey and represents the cycle of sustainability. James Brown's Heirloom Corn "Crepe"
Sunflower Miso Glazed Coho Salmon "Pave"
Wow, what a find just 15 minutes from the center of Lakeway. The food was superb with a splendid and subtle mix of ingredients. Service was attentive, not rushed, and well-informed about the food. We will be back! We enjoyed our visit to Apis for our 50th wedding anniversary. The menu selections for the pris fixe dinner were excellent as my spouse had the flounder and I had the steak selection. Presentation was beautifully done and the food was perfectly prepared. Staff was friendly and prompt with service, and surprised us with a small glass of champagne and an appetizer bite at the end of the dinner. The room was relatively quiet and relaxing with some soft jazz that we did appreciate. We will try to make future anniversary dinners exclusively at Apis, and for the occasional splurge. Apis is phenomenal! Did the price fixe menu and it was totally worth it. Amazing dining experience! We have been there several times, and are always blown away by the quality of the food, cocktails, wine and personal service..
An absolute jewel of a restaurant - one of our all-time favorites. Do yourself a favor and try Apis out. You will be treated to an unbelievable dinner experience, and one you will not soon forget! Food was very good - well intended. Only comment is that appetizer may be a tad overwhelming - almost entree-size. Would definitely return for another try. We’ve been several times and each time the food and service has been outstanding! Asia was our waitress this last time and made us feel very comfortable and was very knowledgeable about the different types of courses that were served. We’ll definitely be back! Love this hill country gem! Thanks for bringing fine dining to Spicewood! Nice restaurant, the tables were a little close so it’s difficult to hold a conversation without over hearing everyone around. Fantastic service; fantastic food; good music and atmosphere while still quiet enough to have a conversation; more than worth the drive from Austin to get there. Setting was very nice. The quality of the steak was less that perfect. I almost thought they got it from the PFG accross the stree. The rest of the meal was good and the staff awsome. If they improved the quality of their main course then it would be worth it. But as it is, will never go again. Steaks were dry and flavorless, potatoes were extremely salty, not a good meal for any price. Wonderful experience! It was our first time, but we had a great dinner. Our biggest highlight was for sure the egg toast! Delicious prix-fixe menu for Valentine's day - hard to choose among the offerings, we were very pleased with our meals. Wonderful restaurant w tremendous focus on quality and presentation. The building is beautiful with natural stone, rustic wood, and a neat hexagonal honeycomb motif tastefully done throughout the decor. The ambiance and service were excellent. The scallop appetizer was exquisite, both in presentation and flavor, and was the highlight of my meal. My husband’s appetizer- a homemade pasta with pork ragout- was also flavorful and delicious. We both got the 6 oz steak for the main course, which was very good, but not outstanding from other good steaks. The only food item I had any complaints about was the shredded potato cake that came with the steak, which was almost too salty for me to eat, which is saying a lot, because I am a salt fiend. Both deserts we ordered- the chocolate torte and maple donuts with coffee ice cream- were super yummy. The food and experience were superb, except for the salty potatoes, but the prices are prohibitive for a very many people. We had a gift card that covered a significant part of our meal, for which we were very thankful. The cost is the only thing that would keep us from going back, even for a special occasion. There are a decent number of restaurants in Austin that have fairly comparable quality of food at a better value. Lovely atmosphere, friendly staff and inventive and delicious food. Cannot wait to return! I have eaten at Apis a total of 4 times over 2 years for special events that my wife and I share. Our last two meals at Apis have been lackluster. On this last trip we both ordered New York strip steak and was not impressed whatsoever especially for the price. One could definitely do a better job at home cooking a more savory steak. Dessert was simply uneventful and rather small unlike in the past. I miss the Apis of old where when you made a reservation they would call not only to confirm the reservation but would ask if it was a special event. This time they made no such effort on 3 distinct calls (long reservation) and in person. For the price tag it is the little things that count. Too far to drive to drive for a bad experience. We loved our meals! We were there on an early Saturday night and enjoyed the choices for a price fixed menu (ie $64 for choice of appetizer, entree and dessert - there were 4 of each to choose from.). The dinner was a foodies delight! My husband and I selected different items and shared bites. However, based on our similar experiences in other cities we think the “stories and details” about the dishes could have been better articulated and used to enhance the experience. this is a great dining experience. We will return. Excellent prix fixe dinner. Complex, interesting, intriguing combinations in not only the appetizers and main course, but also the desserts. In addition to the menu items there were complementary "apps"; a rich, luscious sweet potato "drink", and hearty mesquite flour rolls accompanied with butter/honey/bee pollen. Charleston rice had nice nuttiness and slight crunch, paired well with the tenderness and luscious fattiness of jowl jardons and pork shoulder. Octopus was perfectly prepared - firm but tender (not rubbery), tasty, and complemented well by the smoked squash, lemon foam, etc. Red wattle pig tasting was fabulous with the various accompaniments, particularly the tortellini with a hint of morel. 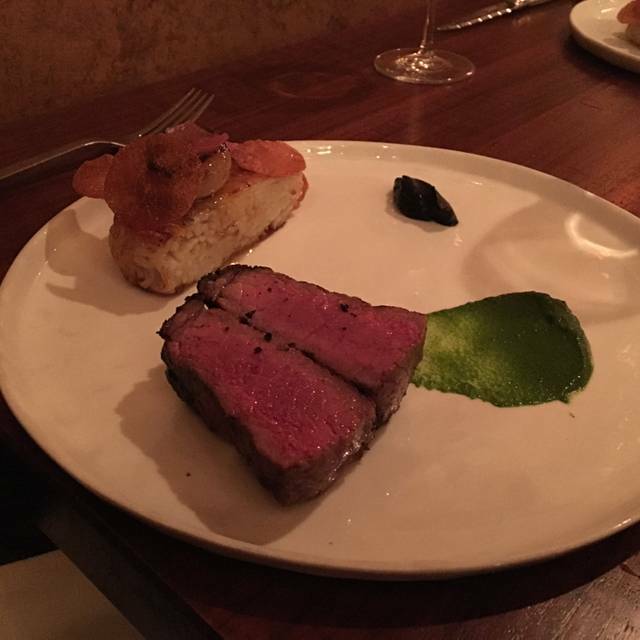 The 60 day dry aged ribeye, though creamy to the taste in some bites, didnt have the nutty or funky complexity I expected of a dry aged steak, nor was it particularly tender (their Laguiole steak knife was absolutely necessary for cutting this). Accompanying cipollini onions and roasted potatoes were excellent, as were the black garlic/pecan (perfect black garlic taste) and the well-blended garlic/chive purees. Desserts (citrus leaf white chocolate mousse, mesquite maple donuts) were very creative. Definitely will be back! We took another couple out to observe her birthday. I informed the reservation person of the special occasion. At the end of the evening when the price fix dessert arrived it had a candle on the side of the plate-how underwhelming and cheap on behalf of Apis. Really, a single candle on an included dessert. I was embarrassed I shared the birthday notice. This was was the 4th time dining at Apis and the quality has deteriorated considerably. Maybe a new chef? In any case we won’t be returning any time soon. Very disappointing. Was looking forward to eating here even though a long drive from Central Austin. But food was really pretty bad. Oysters on half shell tasted old, at least the only one of four eaten; Rice appetizer was okay; salmon was awful; chocolate torte nondescript. Our friends ordered steak, medium rare and medium and there was no discernable difference plus the cut was tuff. We eat out pretty often but no return here. OMG-Can I give 6 stars? Even as self-described 'foodies', my husband and I were thoroughly impressed with Apis. It's on a bunch of splurge lists for a reason! 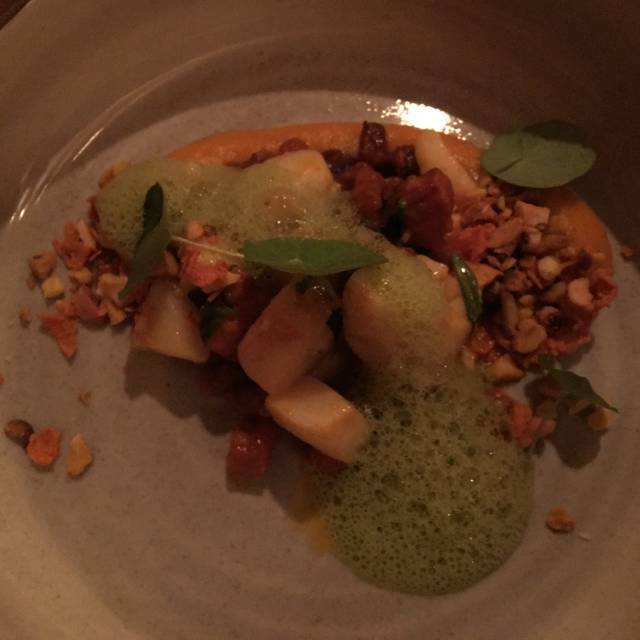 We did their seasonal prix fixe menu (winter 19) and it was heavenly. Husband had the pork with pork (app, charleston golden rice & main, pork tasting plate), I had the beef tartare for app and duck as main. Craft cocktails were also amazing, and worth the price imho. Love that the honey/apiary runs through almost everything on the menu and inside the building without going overboard. I just cannot describe the amazing food in words that would be sufficient, and my tongue can't type. Would/Will/Always recommend Apis, and it will be our go-to for special nights out. We are nearby in Bee Cave, but this is easily worth the drive from Austin, or hell, Dallas. The food was great. Service not so much. Hostess was rude and didn’t seem to know her job well at all. Started by asking us a bunch of questions and then asking us if we wanted the tasting menu all at the podium. Is was so strange. Then wanted to sit us at the bar when a second hostess showed up and was very friendly and seated us right away. Next the waitress was not well informed and didn’t even inform us of the wine pairing. We gathered all the information by listening to the waitress giving the table behind us tons of info. The music was very loud and didn’t fit well in my opinion. Ambiance was not achieved at all. Planters with dead plants on the wall etc. the food was exceptional. But they missed the mark on almost every other aspect. Very elegant and well worth the drive. Treat yourself and try it out. The ambiance was great and the servers were very nice! But for $120 christmas eve dinner per person, the food was totally underwhelming and not worth the visit. Most recent visit was for Christmas Eve...Such a wonderful experience! Amazing food, great atmosphere and excellent service! The food and staff are always fantastic. Apis is our go-to for all special occasions and date nights. Apis is hands-down the best overall restaurant experience in Austin. The menu never disappoints! Meeting friends at Poodie's for music, but wanted a good meal beforehand. Hubs had seen Apis online and we love trying new places. It was a long ways from our Northwest Austin home, but honestly, we would drive out there again! The service was super friendly and unpretentious. The food was delicious. It's pricey, but we totally enjoyed it. An interesting food experience with plenty of creativity on the dishes. Most were very interesting and enjoyable. We had one where the seasoning overshadowed the core ingredient, though admittedly we had high expectations for this one. The intro soup and fish platter were very notable. The cheese plate dessert itself was worth a visit, not large but two of the three cheeses were really excellent, with the 3rd one being fine, accompanied by signature honey and a little great light marmalade. Service was very helpful and nicely timed with no rush. Excellent gourmet farm to table with a bee/honey theme throughout the menu. Had the NY Strip and pork loin for entrees. Both were perfect in every way. Highlight was the sourdough strawberry dessert. Amazing! I rate everything high except the “value” category because there are places as good or even a little better for a lower price. (E.g Dai Due). Worth a trip though. Nice to get a little outside of Austin. Way overpriced. $6 up charge for two tiny pieces of lamp was ridiculous. Food was beautifully prepared and service outstanding. Would not recommend for friends or family, too expensive.